As I write these words the Westminster Kennel Club 138th Annual All-Breed Dog Show is in full-swing. For the uninitiated, Westminster is the largest and most prestigious dog show in the world. It’s a big deal. Every February for more than a century representatives of each and every AKC-recognized breed have duked it out at Westminster for the coveted title of “Best in Show.” The Group and Best in Show rounds are broadcast on national television and watched by millions of dog-lovers around the world. The event is brought to the masses by Big Kibble’s Nestle-Purina, the dog food division of Nestle, S.A. (the largest food company in the world, with about $100 billion in annual revenue). I’ll freely admit that I get a kick out of Westminster, although, as someone who has never competed in conformation, it’s hard for me to explain why. Maybe I’m hypnotized by all the pomp and pageantry. Maybe it’s because I watched it every year with my family when I was a child. Maybe I just like to look at the hundreds of different varieties of cute dogs. Do I find the whole thing a little ridiculous? Yeah, I guess. I (as well as others) find it a bit farcical to host a beauty contest in which the contestants lack all understanding of the concept of beauty. But, in that sense at least, conformation is not all that different from the dozens of different varieties of canine athletic competitions that Varsity Pets enthusiastically supports. Just because the dogs don’t have a clear sense of what is going on doesn’t mean that the activity itself isn’t worthwhile. Do I think that the judging process is so subjective, vague, and exposed to bias and external influences that it renders the whole contest completely unscientific (and, therefore, unfair)? Definitely. But if the competitors don’t mind then who am I to make a fuss about that? If they wanted to make the contest more like a 100-meter dash and less like an arbitrary “greatness” competition then it wouldn’t be all that difficult for them to amend the relevant rules and procedures to make the judging more rigorous and subject to oversight. But that’s not my battle to fight. Do I think it’s wrong to exclude mixed-breed dogs from the event? Not really. Classification mechanisms like breeds, groups, and varieties are practically baked-into the concept of conformation. If you want to make room for mixed-breeds in conformation events, then to a large degree you need to blow the whole thing up and rebuild it from scratch. And there are lots of other cool activities in which mixed-breeds and their people can participate in the meantime. In the end, I try to take a supportive, I’m-okay-you’re-okay attitude when it comes to any activity that helps dog owners bond with and relate to their dogs. And that includes conformation. Far be it from me to begrudge anyone participation in any activity that they enjoy. After all, running ultramarathons probably doesn’t make a lot of sense to most of you. But I like doing it, so I’m going to keep doing it. But here’s the rub: I believe that Westminster is contributing to the canine obesity epidemic. And that I have a problem with. More specifically, I believe that the breed standards to which the competitors in conformation events are judged for conformity are often interpreted by judges in such a way that they reward overweight dogs. As a result, many of the dogs that are being crowned as the best physical specimens that their respective breeds have to offer are in fact carrying around so much body fat that they are likely to die prematurely. And I believe that it’s dangerously misleading to tell the millions of dog-owners who tune in to shows like Westminster that these puppy porkers represent some kind of physical “ideal,” when in reality they are so fat that they are likely to die well before their time. (1) Whether a dog is so overweight as to have a heightened risk of premature death (or not) is not a matter of opinion, it is a matter of fact. (2) By that standard, many of the dogs that have been crowned “Best of Breed” at Westminster are demonstrably overweight. If you accept both of those propositions then you pretty much have to agree with the broader point I’m making here. So let’s look a bit more closely at each one. 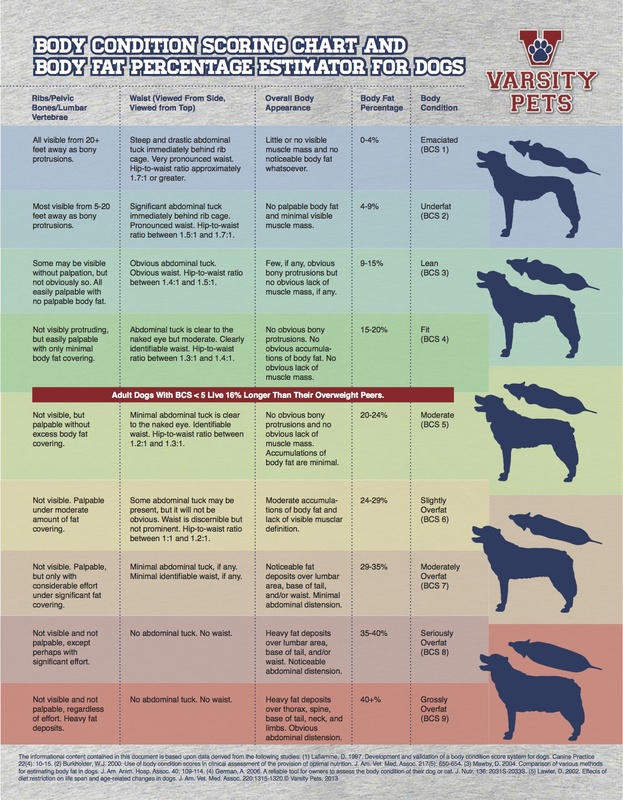 BCS charts reflect the reality that it can be difficult to determine just how fat any specific dog is. Dogs are the most physically-diverse land animals on our planet. Some adult dogs are literally hundreds of times larger than others. 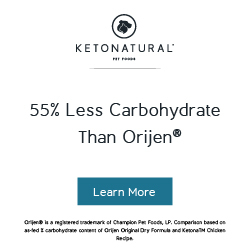 So it’s almost useless to use a metric like body weight to approximate how much fat is in any specific dog’s body, even if you only apply that metric on a breed-by-breed basis. BCS charts, on the other hand, can be used to accurately approximate the amount of fat in any dog’s body, regardless of what breed it is. They rely upon silhouette images and qualitative descriptions of a few canine body-parts (like the ribs, abdominal tuck, and spine) to guide their users to an approximation of how much fat is in their dog’s body. 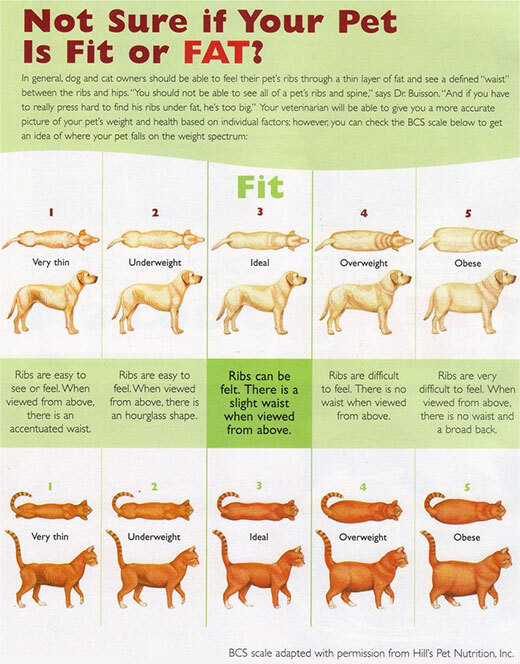 A 2006 study showed that even laypeople with no prior familiarity with BCS charts tend to use them to accurately approximate canine body fat levels. Now, is it the case that we can use BCS charts to determine whether dogs are so fat as to be at a heightened risk of premature death? Yes, it is. In fact, that’s precisely what a team of veterinary researchers showed in 2002. By separating a population of dogs into two groups and restricting the total caloric intake of one group, the researchers created two sets of dogs — one with an average BCS score of about 6.5/9 (moderately overweight) and the other with an average BCS score of about 4.5/9 (closer to ideal, although still a little overweight). So what happened to the two sets of dogs? The moderately overweight ones died, on average, 14% earlier than the fitter ones! To put that into perspective, note that a lifetime of smoking only tends to shorten human lives by about 11%. 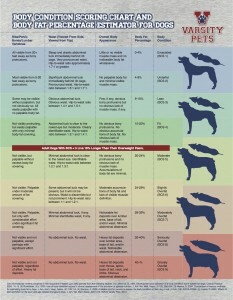 In other words, moderately overweight dogs (as determined using a BCS chart) have a significant risk of premature death. Now let’s turn to the second proposition — that many of the dogs touted as “Best of Breed” at Westminster are in fact demonstrably overweight under a garden-variety BCS analysis. Due to restrictions concerning the use of footage broadcast from Westminster, I can’t show you the specific dogs that really irked me as Coachette and I watched a rerun of the 2012 show last week. But I can do something better than that. I can give you the tools you need to make body condition determinations for yourself as you watch the broadcast of the 2014 Westminster show tonight and tomorrow. I like this chart because, unlike some of the ones that other organizations have published, ours assigns specific body fat percentage ranges to each BCS category. But if you prefer a different BCS chart, feel free to simply download the one you like. Now, just save a copy of your favorite BCS chart to your desktop and pull it up when you tune-in to Westminster tonight and/or tomorrow. Then all you have to do is compare the dogs that you see on your television against the silhouettes and descriptions shown on your BCS chart. I predict that you’ll find that many of the larger dogs (some to keep your eye on include the St. Bernards, the Bernese Mountain Dogs, the Rottweilers, the French Mastiffs, the Bullmastiffs, and the other Mastiff varieties) are obviously overweight. Pay particular attention to the abdominal tuck — the abdominal area immediately in front of the dogs’ hind legs. I think you’ll see that many of the winners at Westminster lack the sharp abdominal tuck that is indicative of an appropriately-lean and healthy dog. I’ll be watching along myself and I’ll weigh in on Wednesday with my thoughts. Please feel free to share yours in the comments section below. Glad to a way to evaluate fitness of our GSD female. She,however, does not like the ball we purchased from you. Do you have any with a softer exterior? Loves the cloth frizby but that requires us to be out with her. Hi Maryann — Sorry to hear that your pup isn’t so into her Varsity Ball. Unfortunately, we don’t offer any rubber or cloth-covered products (not yet, at least!). We’ll definitely keep you in mind as we pursue those though. Cheers. Glad to have a way to evaluate the fitness of our GSD female. Overweight dogs sadden me. It seems cruel to inhibit their ability to play and to make the end of life more miserable.